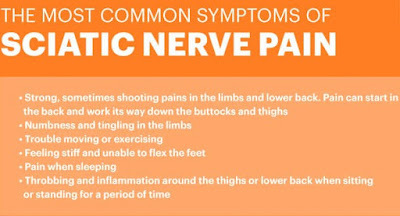 Sciatica is pain, tingling, or numbness produced by an irritation of the nerve roots that lead to thesciatic nerve. The sciatic nerve is formed by the nerve roots coming out of the spinal cord into the lower back. The sciatic nerve is the largest nerve in the human body. Multiple strands of nerve fiber form this huge nerve: the strands weave together as they emerge from the spinal cord in the lower back area & pass under the deep muscles of the buttocks, through a notch in the base of the pelvic bone “girdle" & then splay out & down the legs. The branches of the sciatic nerve cover the front, sides & back of the legs, all the way down to the toes. Severe injuries to the sciatic nerve can compromise bowel & bladder function. 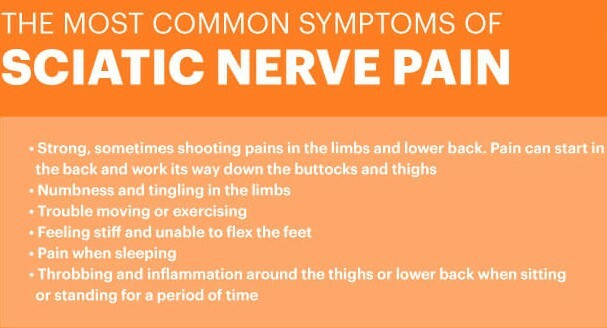 First distinguish, whether the sciatic pain is due to nerve compression (usually because of a bulging or herniated disc or Piriformis syndrome. In Piriformis syndrome, the piriformis muscle, located under the gluteus muscles, goes into spasm & contracts. The tightening of the piriformis muscles, causing inappropriate firing of the sciatic nerve. The resulting pain, which can be local (in the buttocks) or go some or all of the way down the leg, can be debilitating & prohibit sitting on lying on the affected side. Getting up from the chair or bending over to pull on boots can be excruciating. You put a heating pad on your bottom for 20 minutes or so at bedtime & the pain is better in the morning. Stretch the Piriformis muscles several times daily. It is difficult to do so, as it is so deep. The Piriformis covers a short distance from the outer edge of the sacrum (the base of the spine) to the top of the femur (Thigh bone). To stretch the Piriformis, lie on your back on the floor & bring the knee of the affected side toward the opposite right shoulder. Back off this causes pain. If you have Piriformis syndrome, avoid doing the King Pigeon Yoga pose, which creates outward rotation of the femur. If your pain is worse in the morning, try ice instead, especially 5-10 minutes before bed. Ice is beneficial for nerve inflammation. If your sciatica improves with bedtime icing, the problem is inflammation, which is most likely caused by a ruptured or bulging disc. When a disc, which acts as a shock absorber between each bony vertebra, bulges or ruptures, it puts insistent pressure on the sensitive nerves of the spine. Include enough Turmeric & Ginger. Also include Fresh Green Leafy vegetables. Drink 8-10 glasses of water daily. Avoid sitting for long hours & try walking gently for 20 minutes twice daily. If you need to sit, Place a soft pillow under your bottom & roll a hand towel into a small boister to put behind your waist. This will help to maintain the natural curvature of your lumber spine (low back) & prevent Slimping. Massaging the muscles of the buttocks & back of the legs (where the sciatic nerve runs) can loosen muscle tension & decrease painful nerve inflammation. It promotes blood circulation which will ease sciatic nerve tenderness & built up tension.